Back before I was a real blogger and knew anything about networking and community, I just posted random stuff on ShoestoShiraz and I kinda liked it. My sister would occasionally do a food post for me (always healthy and nutritious) and because I really miss her recipes, I thought I'd do a throwback today for our #tastytuesday link up. Here are some unique ideas for your weekly menu which originally appeared on ShoestoShiraz. I do miss blogging about food a bit and as a dietitian and fellow food lover, I like to share my trials and tribulations with food with all of you out there. This week I am trying quite a few new recipes so I thought I would share them with you. So far, all of them have been a great success (say that with an accent, please). This was a delicious meal. The salad was absolutely tasty. I didn't use the dressing in the recipe since I didn't have most of the ingredients but found another easy dressing online. It went very well with the salad. Heat oven to 400. Grease a baking sheet with 1 tsp oil. 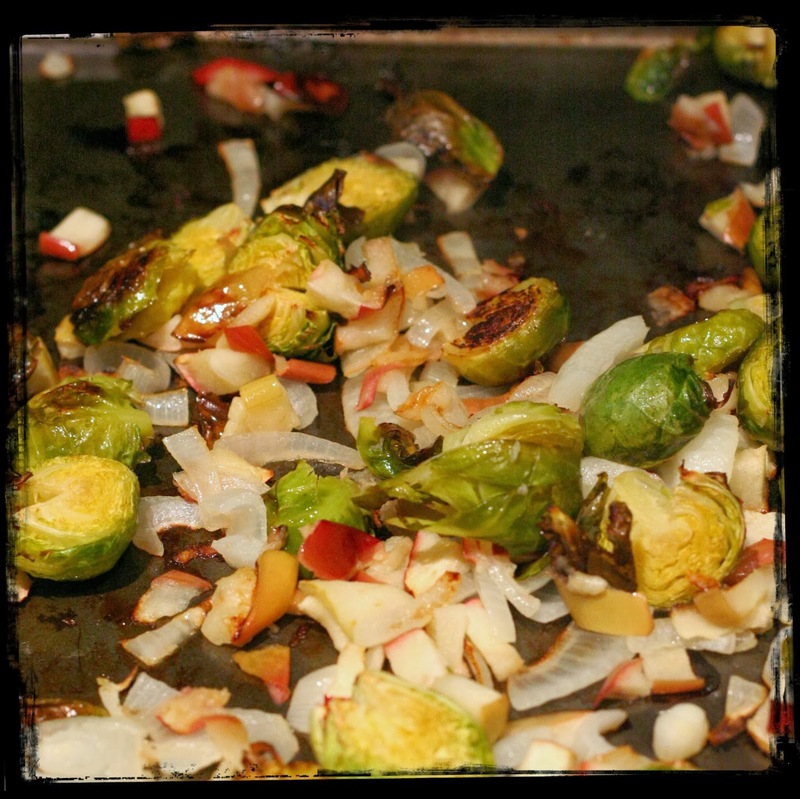 In a bowl, combine brussels sprouts, apple, onion and remaining 1 tbsp oil; toss to coat. 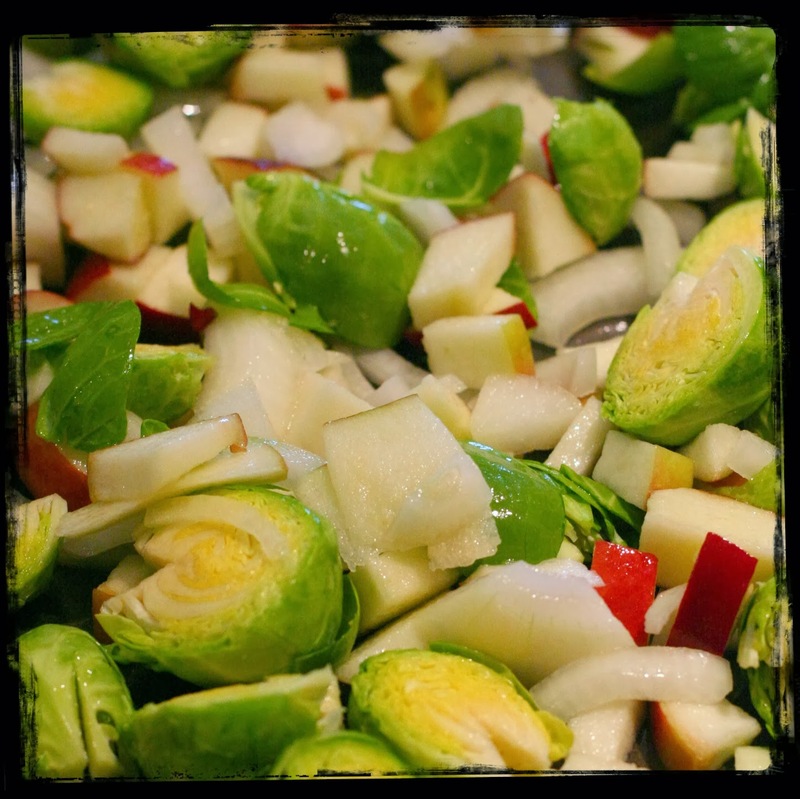 Roast on baking sheet, turning once, until sprouts are brown and tender, 25 to 30 minutes. In a bowl, whisk together tahini, vinegar, syrup, miso, red pepper and 1/4 cup plus 1 tbsp water until smooth; set aside. Heat in a large skillet over medium heat. Toast hazelnuts 3 to 5 minutes, stirring occasionally. Divide spinach, sprout mixture, hazelnuts, blue cheese and tahini dressing amount 4 plates. Season with salt and black pepper. For lunch on Tuesday, I made us some tomato soup. I made this recipe a few weeks ago and really enjoyed it. Especially when you make grilled cheese croutons to go in it. The recipe was in the February Chatelaine magazine and can be found here. I also included the recipe below. Melt 2 tbsp butter in a large saucepan over medium. Add onion and garlic. Cook until onion is soft, 4 to 5 min. Add carrots, celery, pepper, tomato paste, lime juice, sugar, salt and cayenne. Season with fresh pepper. Cook until vegetables begin to soften, stirring occasionally, 4 to 5 min. Add broth and diced tomatoes and juices. Bring to a boil, then reduce heat to low. Simmer until vegetables are tender, 20 min. Puree in 2 batches in a blender until smooth. Return to saucepan set over low to keep warm. Spread 2 tbsp butter on both sides of each bread slice. Heat a large frying pan over medium and lay 2 slices in pan. Top each with 1 slice of cheese, then remaining bread. Cook, flipping halfway, until cheese is melted and bread is golden, 4 min. Remove from pan and let cool slightly. Cut into 1/2-in. cubes. Ladle soup into bowls and top with grilled cheese croutons. Heat oven to 375°. In a large sauté pan over medium heat, heat oil. Add onions and garlic; toss to coat. Add 1 cup stock; cover and reduce heat; simmer until onions are soft, 20 minutes. Reserve 1/2 cup liquid. Add scallions, oregano, salt and pepper to onion mixture; increase heat to medium and cook, stirring, until liquid evaporates, 20 minutes. Cook noodles as directed on package; drain and blot dry. Cook spinach as directed on package; drain, squeeze dry, and season with salt and pepper. In a small saucepan over medium heat, melt butter. Add flour; stir until roux is brown, 2 to 3 minutes. Add remaining 1/2 cup stock to reserved liquid; whisk into roux until thick, 5 minutes. In a bowl, beat egg; stir in ricotta and zest. Coat a 9" x 13" pan with cooking spray; spread half of stock-roux mixture on bottom. Line pan with 3 noodles; layer on half of onion and ricotta mixtures, half of spinach and ⅓ cup Parmesan. Repeat layer with 3 noodles, remaining onion and ricotta mixtures and spinach, and ⅓ cup Parmesan. Top with remaining 3 noodles, half of stock-roux mixture and ⅓ cup grated Parmesan. Cover with foil; bake until light brown, 50 minutes. Reduce heat to 325°; remove foil and bake 15 minutes more. Let lasagna sit 15 minutes; serve. I originally planned to make the above recipe but when Autumn suggested adding lentils, I pretty much made a totally different recipe. I sautéed 1 onion and a couple of garlic cloves, added the lentils (canned - drained &amp; rinsed), pasta sauce and some spices. I used cottage cheese instead of ricotta, since that is what I had on-hand. I mixed the cottage cheese, egg, parmesan and pepper together. I layered the noodles, sauce, cottage cheese mixture and spinach and topped it all off with mozzarella. Quite tasty! The girls devoured the lasagna, so that was a good sign. I was so excited to try this pizza for supper. I have been eyeing it up for sometime and tonight was the night to give it a go. The pizza turned out delicious. It was a nice change to what I normally make. My daughter was stealing all of the kale while I made the pizza so I guess I will be adding more kale to our menu. I used feta cheese instead of the goat cheese and made my own pizza crust. I also added some mushrooms to the pizza. Heat oven to 425°. Boil a large pot of water. Cook potato in water until fork-tender, 7 to 10 minutes. Remove from heat, drain and let cool 5 minutes. In a food processor, pulse potato, 1 tbsp oil, red pepper and a pinch of salt until sauce is smooth. Roll out dough until 1/4 inch thick. Spread potato sauce evenly over dough. 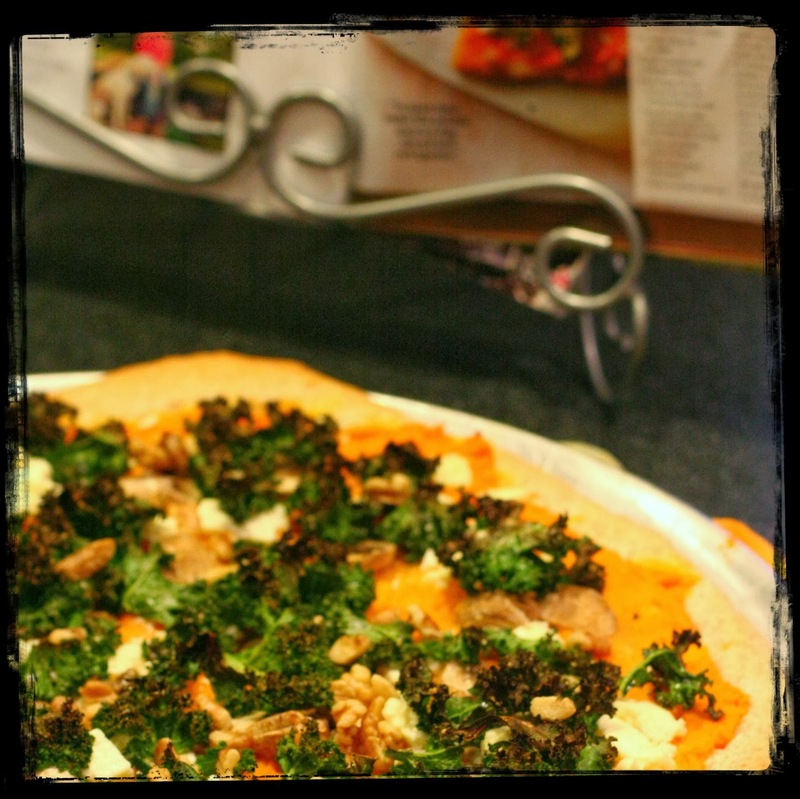 Toss kale in remaining 1/2 tbsp oil; top pizza with goat cheese, kale and Parmesan. Bake until crust is golden, 10 to 15 minutes, sprinkling on walnuts in final 2 minutes. I hope you give some of the recipes a try!